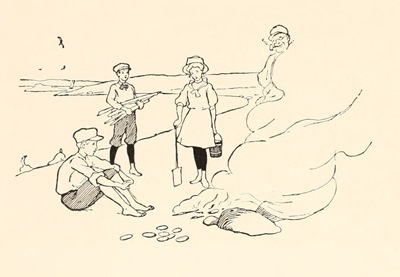 How charming is this little line drawing from a vintage children’s book? A trio of friends fishing is the subject of this drawing. Two young boys and a young girl are all fishing from a dock and a small boat tied to the dock. Off in the distance appears to be a large bridge and at least one large ship at port. It does appear that the kids may not really hope to catch anything. After all, they don’t have a bucket or a creel to take their catch home in – just three friends having fun on a nice day. This fishing image was drawn by Elmer Boyd Smith (1860-1943) who also wrote The Seashore Book which was published in 1912.